Last article I described a treatment regimen to rehabilitate my friend and longtime chiropractic client, Mr. Beau Robb, following a severe motorcycle accident in May of last year. Mr. Robb was seeing me for one month with excellent results, and so after that time we were ready, and able, to move him forward in the treatment plan. Whereas round one was about neurological restimulation and light movement, round two focused on increasing movement and challenge. The following paragraphs will discuss this plan and how we implemented it, and we’ll finish with a few words on the impact of the mind on the healing process, as well as discuss some neurological aspects involved. As movement began to improve, Mr. Robb reported using the crutches a bit less,and started periodically walking with a cane. He was still in significant pain, but chose not to use the pain pillsregularly. The next level of care was to consist of neuromuscular reeducation of a different sort; we were now going to challenge the musculo-tendinous tissue and fascia to lengthen around the wounds and the joints, and stimulate bone growth near and around the fracture points to prepare for weight bearing. Post-isometric relaxation (PIR) – a neuromuscular decontraction and reeducation therapy. Proprioceptive neuromuscular facilitation (PNF) – a contract/relax exercise that uses reciprocal inhibition. Rationale: To release guarding and bring length to musculotendionous tissue. Done primarily on the quadriceps, soleus and ilitotibial band (ITB). Rationale: To stimulate joint proprioception of the ankle and feet. Short foot and foot scrubbing to start process and develop foot/arch control. 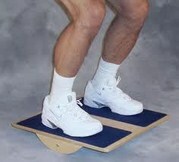 To develop foot stability and prepare for weight bearing. Rocker board done in seated position, and ankle challenged in three planes. The second round ended at four weeks. At that time, knee flexion (as measured bygoniometer) had gone from 115 degrees maximum flexion to 100 degrees. Mr. Robb had discontinued his use of crutches, and was walking primarily with a cane. Slight weight-bearing was possible, and cane-less walking began to be introduced. Ayurveda and massage were decreased and eventually phased out. We continued the chiropractic adjustments and periodic muscle work in the low back and neck regions to relieve guarding and day-to-day compensatory stiffness. As with the second round, new movements and exercises with increasing complexity were introduced gradually. We moved into the weight bearing exercises and active stretches, and yoga. Functional movements were introduced. This round lasted four weeks. Rationale: To condition the proprioceptive system of the knee and ankle joints, as well as globally. To challenge the joints and bones in weight-bearing, stimulating bone deposition and density through Wolff’s Law (bone in a healthy person or animal will adapt to the loads it is placed under). Toward the end of the round, we added half-squats and calf-raises to the one-legged balance to challenge shin bones and ankle joint under new planes of stress. Rationale: To bring length to the psoas muscle for increased mobility and return to function hip motion. Initially done alongside stable objects for bracing, but eventually moved into unassisted, active stretching. Down dogs and calf stretches (on stairs) were introduced toward end of round. Rationale: To increase strength of gluteals, hamstrings, quadriceps and calves. To challenge client in complex movement with weight-bearing. To strengthen bone and increase density (stability). To synchronize muscle movements of the legs. To increase proprioception. But most importantly, to stimulate increases in range of motion of the knee and ankle joints by the use of gravity and client’s full body weight. Started with 2 sets/15 reps and graduated to 2/20 within two weeks. Treated left patellar tendon with ultrasound immediately following sets to reduce acute inflammation. Round three ended with the greatest external gains. During this time, knee flexion improved to well past 90 degrees, and today has reached 70 degrees. Mr. Robb discontinued crutches altogether, and now splits time between using a cane and walking unassisted. During this period, Mr. Robb started riding a stationary bike, and today he rides at the beach for several miles. Rationale: To introduce functional movements that simulate locomotion, and challenge leg in new planes of stress. Client is challenged in foot/ankle coordination and is apprehensive. Limited range of motion also still challenges the client psychologically. This exercise should prepare Mr. Robb for more strenuous weight-bearing like carrying loads and running. Rationale: To strengthen and coordinate abdominal core and pelvic movements. Preparation for more advanced exercises and stretches. Challenge could potentially come from a disconnect of these movements from the overall scheme. Necessary to stress their importance. Rationale: Greater proprioceptive and weight-bearing challenge on an uneven surface. Should prepare for maintenance of stability during off-balance moments, as well as future plyometrics. Challenges should only be mental and would likely diminish completely over time. Rationale: To move from compensatory walking to full weight-bearing locomotion. Preparation for jogging and running. This should be done slowly and deliberately to retrain muscles and joints to work synergistically. Rationale: To ultimately return to complete function and maximal activity. Although I wouldn’t expect this to happen sooner than one year’s time, Mr. Robb demonstrates the drive and desire to accomplish it by six months. Mr. Robb has been progressing above satisfactorily. Although I expect to discharge him within a few more weeks, he could continue his rehabilitation with a practitioner or on his own. Mr. Robb can be confident that if he follows the principles we observed throughout his rehabilitation—like movement mimicry to start out and then gradual introduction of exercises—he should have minimal problems incorporating these following exercises into his regimen. The mind is a powerful thing, particularly when it comes to healing—in fact, we cannot separate the mind from healing. I have found in my own Los Angeles sports chiropractic practice that some people will even block or slow down theirhealing processes by adopting certain perspectives. The first crucial factor in aligning the mind for healing is to have a belief—a certainty—that we are incredible self-healing, self-regulating organisms. This is no small point: many illnesses could be transcended by adopting this particular belief; there is nothing to lose by doing so, and I assure you it is the truth, supported by numerous studies, so why not accept this universal principle? Think again of the Rocky Bleier story I told in the previous article. He was able to heal, and return to professional football precisely because of this belief. We all have the ability to do what Rocky Bleier did, and Mr. Beau Robb is another living example. This is a universal truth that never stops inspiring me. 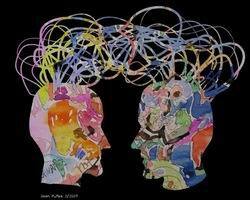 The next aspect of mind crucial to the healing process is the individual drive of the person seeking healing. Now it would not surprise me to find that some people think this to be an obvious aspiration—the drive to achieve full recovery—but I assure you that desire and drive are two different things. While one may have the want, the desire, to heal, their drive to actually go through the work and pain necessary to achieve full recovery may be incongruent. Simple as this—if you want to heal, you’ll have to do the work (or make the changes depending on the condition we’re talking about). Mr. Robb could tell you that the rehab we took him through was not fun, but the rewards have been enormous. With a rehabilitation of this nature, one where we are working to return neurological and biomechanical function, there will be pain and frustration involved. And the skilled practitioner will know how to push the client just enough to promote growth, but not too much to delay or even reverse the healing. In other words, there is a fine line between growth and injury, and a skilled rehab practitioner knows this space and its parameters. It is in this small region of recovery that healing is maximized. But work will certainly be required. There have been some interesting findings in the world of physical rehabilitative science. For instance, recent studies have found that when monkeys in a lab reached out to grab peanuts placed in front of them, the electrical activity in their brains (neurons firing) was the same as when they simply watched one of the scientists reach out to grab the peanuts—in other words, their neuronal firing in the observing monkey mimicked the brain activity of a monkey actually reaching out to grab peanuts. In a second study, scientists recreated the same phenomenon in humans, and they found that neurons of particular motor areas become activated in humans even when they observe directed behavior—chewing food, throwing a ball, performing a dance—whether they do it themselves or simply watch someone else do it. These brain cells are called “mirror neurons” and they are stimulated whether we perform an action or follow another person doing it. They are thought to be abundant throughout brain regions responsible for planning and initiating action. 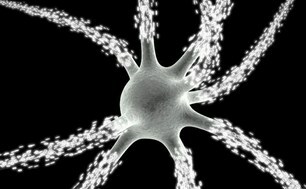 You can probably see how motor neurons are important in the rehabilitation process. By watching the practitioner perform certain movements and then mimicking the movements themselves, the client has the power of stimulating both motor and mirror neurons. Finally, another technique called motor imagery uses mirrors to trick clients’ brains into believing that they are moving a paralyzed limb. How it works is that client sits at one end of a mirror in a way that the injured limb is behind the mirror and the normally functioning limb is in front. Using a tilt, the view to the client is of the normal limb and its mirror image. Scientist have found that by having the client move the normal limb, and simultaneously imagining moving the paralyzed limb, brain regions are stimulated that allow firing of the motor nerves controlling the injured limb, and thus new connections formed. We actually used this technique with Mr. Robb in the beginning of his rehab care. As our rationale was to reestablish the neurological connections of movement to his fractured leg, we found the mirror technique to rather useful. I hope that you have been as intrigued by this case as I have. I never stop being fascinated by the human body and its incredible nervous system. 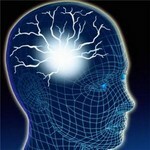 The mind, as the main controller and influencer of the nervous system, is integral to the healing process. When working to help people heal from injuries, the patient’s mind cannot be ignored. Belief and certainty in the miraculous self-healing ability of the human body must be there, as well as a firm drive to carry out the work necessary to stimulate that healing. 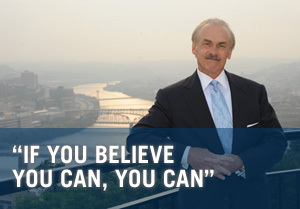 Rocky Bleier showed us what can be done, and Mr. Beau Robb has helped prove the potential we all possess. If you are trying to recover from or heal an injury—you’d be wise to trust your healing powers, and work hard to make it happen. I’ve seen it with my own eyes—it can be done.